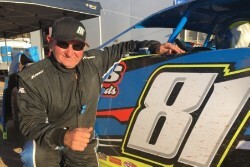 Gary Higgs has set the quick in official practice for the WA Super Sedan Title being held at the Makit Hardware Narrogin Speedway. Higgs set the quick time late in the two hour practice session with conditions warm and extremely windy. Less than half the field practiced. Racing gets underway from 6pm tomorrow night with results to be posted on the Speedway Sedans Western Australia Facebook page.